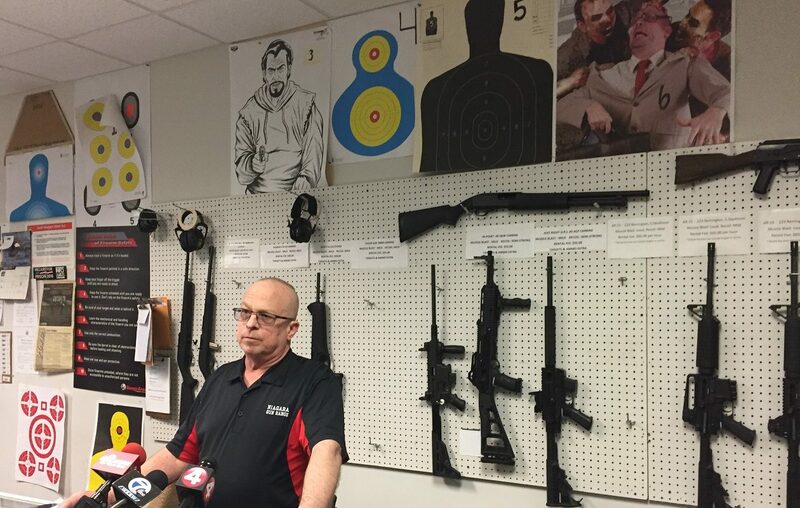 Those who used the Niagara Gun Range in Wheatfield were “in no danger,” its general manager said, even though widespread lead contamination was found during an inspection there in December. Operators of the range invited reporters and television news camera crews to tour the range, located on Niagara Falls Boulevard. The business sees tens of thousands of customers a year, Brodsky said. Tuesday's tour and press conference came on the day The Buffalo News published a story about an inspection that found high levels of lead contamination at a facility where federal customs officers have trained for years. “You couldn’t even breathe when you were shooting your guns,” a union official for customs officers told The News. Part of the range had been leased by U.S. Customs and Border Protection and was not used by the general public, Brodsky said. The agency let that lease – which was in place at the facility since the building was built about 20 years ago, he said – lapse in January. “Our range has been professionally cleaned since the high lead levels were discovered and periodic cleanings have been scheduled to prevent lead levels from ever reaching unsafe levels,” Brodsky said. Customs and Border Protection ordered blood tests for officers following the December inspection and found two officers had blood lead levels that were unusually high. The lead contamination has not led to any serious health effects, according to a local spokesman for the agency. Brodsky attributed the contamination on mechanical failures and human error on the range used by customs officers. An air handler was broken for several days and a water tank overflowed due to a faucet being left on, which caused water from the tank that catches spent rounds to collect on the floor, he said. The tank did not leak, Brodsky said, adding that the overflow was caused by human error. The air system for that range is separate from the other range and the rest of the business, he said. Niagara Gun Range has an eight-lane firing range open to the public, as well as a six-lane range that had been leased to the customs agency and a retail area. That included a microwave and coffee pot. The appliance and the coffee pot were located in a “multiple occupancy office” not accessible to the general public, Brodsky said. “They didn’t clean their own coffee pot or their microwave,” he said Tuesday. Brodsky said he has worked at the range for seven years, starting as a firearms instructor. He said one blood test he took several years ago while working at the range showed elevated lead levels. The business, owned by Susan Kulwicki, has been cleaned to meet federal standards, said Gabriel J. Ferber, an attorney for the range.